KULTUR & ART Initiative e.V. “Get Your Own Picture” film workshop will again take place in Detmold. The Get Your Own Picture Project unites young people from Countries Estonia, Germany, and Turkey led by four team leaders. With the different cultural contexts and different religious views, the participants will experience that there are still a lot of similarities among themselves. We will work all together (Workshops: the theoretical basics of making movies) with international mixed mini groups (realizing film ideas relating to the topic “Europeanness” and shooting short films). We are an open-minded organization from Germany that has a lot of ideas and experience in managing youth projects / work camps and it has experienced members, in cooperation with other project partners. We are capable of implementing a successful project. Who can apply for the workshop? The workshop is aimed at young people between 18-30 years old. How do I apply for the workshop? Applicants should complete and submit the application form. What is the content of the workshop? 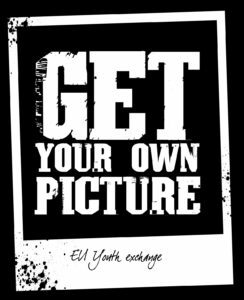 “Get your own Picture” is a youth exchange in which 60 young people from the European countries meet and film their own short films together for 10 days. After learning about the theories of making films, participants will be supported in transforming their ideas into practise and make their own film. The main aim of the workshop? The main aim is to give them an understanding of films as a medium for expression of opinion and participation. They will deal with the question of differences and similarities between the cultures and will go into detail with the youth’s interests. Participants will become aware of their shared historical roots and can experience interculturalism. How can I improve myself during the workshop? Workshop is a safe, playful, and educational environment where youth develop a deeper self-expression and self-awareness of themselves. What does it cost to attend the workshop? We do encourage donations and also ask for support in the form of voluntary membership. Will workshop make use of such certificates? The participants will receive a Youthpass at the end of the workshop to validate the competences acquired by the participants during their experiences abroad. How can I get visa? If needed, Kultur & Art is responsible for writing an invitation for getting the visas. How to I get to the venue? Kultur & Art gives handy tips for a safe journey to the participants. Participants can travel together. Bring Your Own Device: If you have, your own film equipment (camera, tripod, etc.) and your own personal stuff. Participants will stay together. Kultur & Art will provide accommodation.